The Tradition at Parks Edge is an upscale, fully maintained community conveniently located behind Jacobson Park in Lexington, Kentucky. The park-like setting is a community of spacious, elegant homes that are a wonderful blend of traditional beauty and modern technology. The Tradition at Parks Edge is comprised of 99 attached homes on 30 acres of which two-thirds has been preserved for lush greenery with tree lined landscaping and decorative colonial street lamps. In addition to the large open green spaces the community offers a paved walking trail that meanders along the beautifully landscaped areas. The community is conveniently located near shopping, schools, parks, world class medical services and major regional arteries. 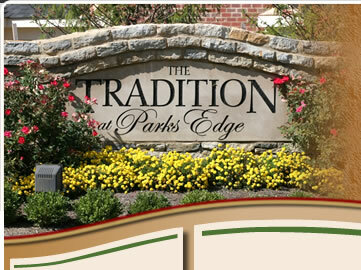 The Tradition at Parks Edge is organized as a Townhouse Association and is a Kentucky non-stock, non-profit corporation. The Articles of Incorporation are filed with the Kentucky Secretary of State. The association provides exterior maintenance, landscaping, and building insurance. All owners are automatic members in the association and governed by the Master Deed, Bylaws and Rules and Regulations. Board meetings are held on a quarterly basis (dates to be determined) at the office of Community Management Associates located at 1795 Alysheba Way, Suite 3103, Lexington, KY at 1:00 PM. Residents are welcome to attend the meetings. If a resident has an issue to bring before the board, and placed on the agenda, please contact the Association Manager at Community Management Associates, LLC at 859-263-8757, ext. 202 or manager@traditionatparksedge.com.